This pagoda may be one of the oldest in Viet Nam According to legend; it was built during the reign of King Ly Nam De (544-548). Originally, the pagoda was built adjacent 10 the bank of the Cái River (the Red River) and called Khai Quốc (Founding the Nation). It was renamed by King Lê Thái Tông (J 434- 1442) An Quốc (Safeguarding the Nation). In the reign of King Lê Kính Tông (1600-1618), the river bank broke. 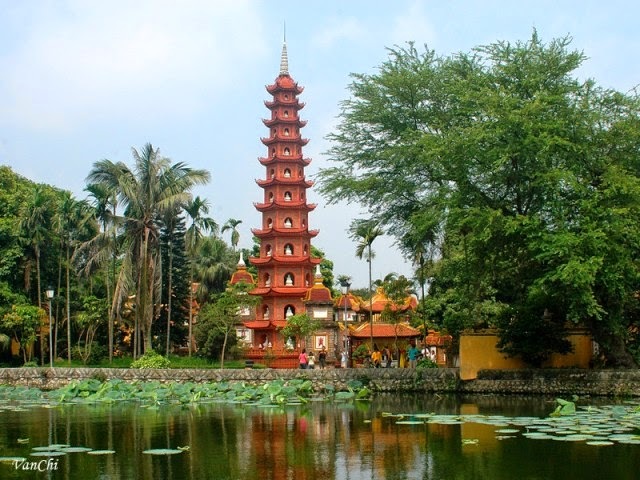 The Tran Quoc Pagoda was moved to Cá Vàng Island in the middle of West Lake (i.e. its current location) where the Lý Kings had Thúy Hoa Palace built and the Trần Dynasty had Hàm Nguyên Palace constructed. King Le Hy Tong (1680-1705) renamed the pagoda Tran Quoc (Protecting the Nation). In about the 15th or 17th century, people built the Co Ngu dyke and a path connecting the dyke and Cá Vàng Island. The present pagoda still maintains its unique architecture so different from others. At the front is the great ceremonial hall; in the middle is the main sanctuary. At the rear are two corridors and the bell tower. Inside the pagoda there are various beautiful statues, the most noteworthy of which is the wooden gilded statue of Sakyamuni in Para Nirvana. There are also many stone steles. The oldest of them was created in 1639 011 which Dr. Nguyen Xuan Chinh wrote the history of the major repairs to this pagoda in that very year. there is a luxuriant Bodhi tree in the pagoda’s compound, which is the present of the President of India, who paid a visit to the pagoda in 1959.